Contrary to popular belief, voters have historically been pretty good at getting the government they want. Despite being involved in dozens of different elections across large geographies, we are, collectively, exceptional strategic voters. Want a new government? Easy. Want to return the government with a reduced majority? We can probably do that. A minority government? People from many jurisdictions have dialled that in effectively. We don’t even necessarily know we’re doing it. But we winnow the list of options down to viable ones, assess what impact our choices will make and consider how these choices will aggregate with the choices our neighbours make. hard data (polling, fundraising numbers, sign counts, etc.) to gauge the horserace. But here in Alberta we are facing a perfect storm that could throw all of this out of sync. All of the parties have new leaders since 2012. Trajectory is impossible to ascertain as there are no two data points to compare. The Wildrose was destroyed and reborn in the last 12 months. The Alberta Party and Wildrose didn’t even exist 10 years ago, and the Liberals are not running a full slate for the first time since there was a modern Liberal party. We don’t know what a safe PC seat looks like in this environment. We don’t know what an accessible seat for the NDs looks like. There’s simply no historical data that is remotely relevant to our current situation. Is the Wildrose too scary? Is the NDP extremist? Well, there’s breaking campaign promises, and then there’s Alberta. Last election, the PCs (successfully) spent a great deal of time and energy convincing progressives to vote for the government to ward off the risk of an extremist Wildrose—a group that was subsequently embraced by the PCs and largely integrated into its caucus. Similarly, the Wildrose told us no change of leader could change the PCs. A new government was necessary, it insisted, right up until the week before it joined the government en masse. We elected (former?) Premier Alison Redford and a large Wildrose opposition. It took two years to remove the first, and six months more to kill off the second. We don’t even know if voting for one party gets us that party. It’s not hard to feel existential—and indifferent to our votes—in such a situation. 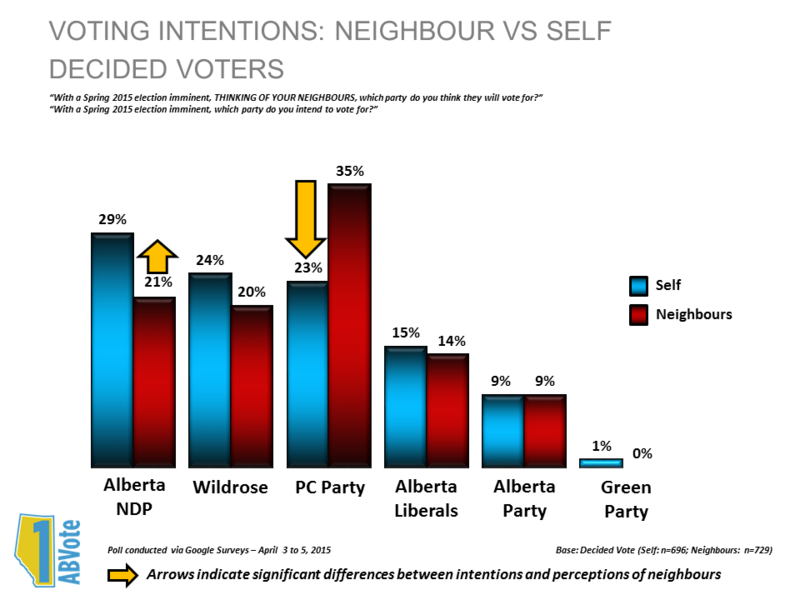 Albertans remember the polling at the start of the 2012 election very well. The Wildrose had a large lead, but the PC party is the one that ended up with the government. Since then, pollsters have had a near unbroken string of major misses. The B.C. election, the Quebec election and the Ontario election all unfolded differently than predicted. Since the call of the Alberta election there has not been one public poll released that shows the PCs in the lead. Many, in fact, show the PCs in third place. Yet, you’re hard pressed to find too many people who believe the PCs will actually lose. Not because they haven’t seen polls, or believe the situation will change, but because they out and out don’t believe them. As illustrated in this poll from 1ABVote, there is a sense of PC inevitability, and a sense that Albertans are more likely to vote PC than can be accounted for. This third and final point might be the most dangerous. Rejecting polling outright is a major overcorrection from 2012 and a bit of a misremembering of history. Polls are snapshots. And while most of the polling done showed a Wildrose win, polling in the last week—where Wildrose candidates made “lake of fire” comments and Danielle Smith claimed the science wasn’t settled on climate change—tightened up considerably. Is polling perfect? Absolutely not. But when all of your polls are telling you the same things about momentum, placement and intent—and you ignore that data—you’re no better than somebody who shuts their eyes, rather than risk being tricked by an optical illusion. Voters have reason to mistrust all of their inputs, and when you don’t trust the inputs rational decision-making is impossible. When you have no precedent, don’t know the consequences of your actions and don’t trust the data that would allow you to gauge them anyhow, the system has failed fundamentally. This is dangerous territory, where any outcome is possible. We’ve been badly burned by the past. But if we continue to be so nihilistic about this election, we’ll have nobody to blame for the outcomes but ourselves.